I first read about the Medicine Wheel in the 1970s. It was around then we began to occasionally read novels by Louis L’Amour, simple “westerns” without much literary value that provided relief from the daily grind. They were better than most fare on television. It was in one or more of those novels that we first discovered the Medicine Wheel. 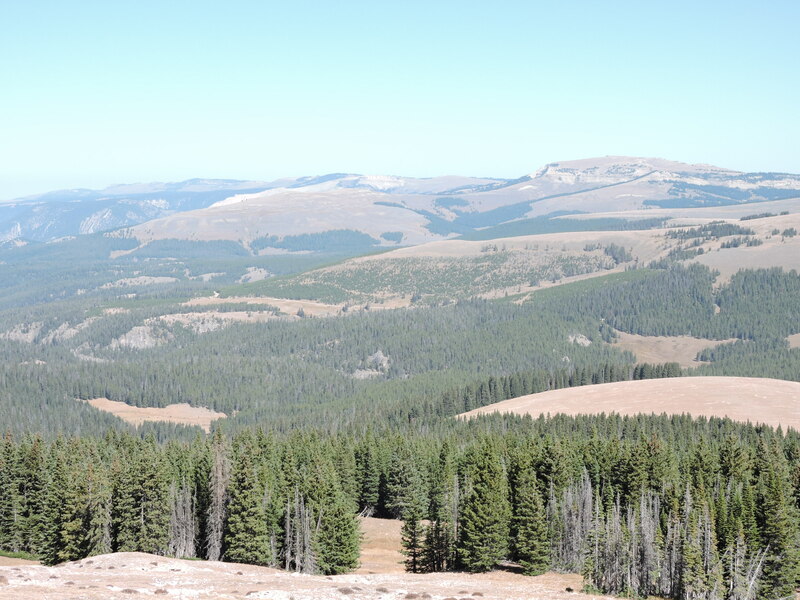 As we crossed the Bighorn Mountains on our way from Sheridan, Wyoming to Cody, we saw a road to the Medicine Wheel about 46 miles west of Sheridan. We had to turn off. The Wheel lies at 9,640 feet. Wood in the center has been dated to 1760, but it is thought that First Americans used the site as much as seven thousand years ago. Now part of a 4,080 acre National Landmark administered by the Forest Service, the Medicine Wheel is still used for sacred ceremonies by the Crow on whose tribal lands it rests as well as some other First Americans. 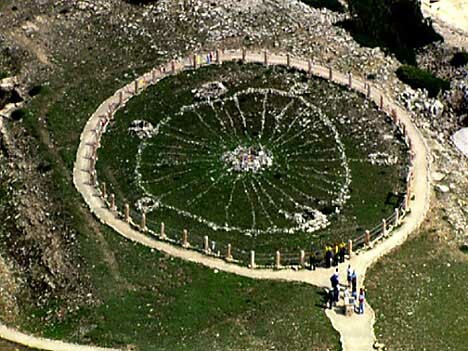 The Medicine Wheel consists of a central stone cairn about 10 to 12 feet in diameter with 28 spokes made of limestone rocks extending to an outer circle. Six more cairns are near the outer circle. The Forest Service has fenced it off and constructed a path around the edge. Because the surrounding land is relatively flat, one really needs a drone to get a good photo. I found this un-credited image on the Internet. No copyright infringement is intended. The site is open from mid to late June until mid September. Visitors are required to walk from a parking lot to the Wheel, about three miles round trip. It is possible to get permission to drive those with mobility issues closer, but no one was around to ask, so Alie remained behind to enjoy the mountain views while I walked. In some First American accounts, such sites play a navigational role and perhaps have astronomical meaning, as well as providing a place to camp, pray and seek visions. For the rest of us, it is just interesting to be in the mountains at a place that has had importance to people from very ancient times to this day. This entry was posted in Travel Logs and tagged Bighorn Mountains, First Americans, Louis L'Amour, Medicine Wheel, Rocky Mountains, Travel, Wyoming. Bookmark the permalink. An amazing, new sight for us. Looked it up on Google Earth for a bird’s eye view. Its on a ridge. thanks for the introduction. What an interesting spiritual place. Sometimes one gets a special feeling, while visiting them. I once visited Navajo National Monument and had the feeling that spirits were all around and over the place. The aerial view really shows how remarkable this medicine wheel is. I hope we will be able to visit there one day. I hope so too, it is about a day’s drive for you if you were going straight there. We would definitely combine it with visits to a few more regional attractions, have wanted to head in that direction for a while. A sacral place. Thanks God, we still preserve such things. Some more beautiful pictorial history and thank you. We missed that one. Hope to visit it this summer. My wife and I like little weekend road trips.